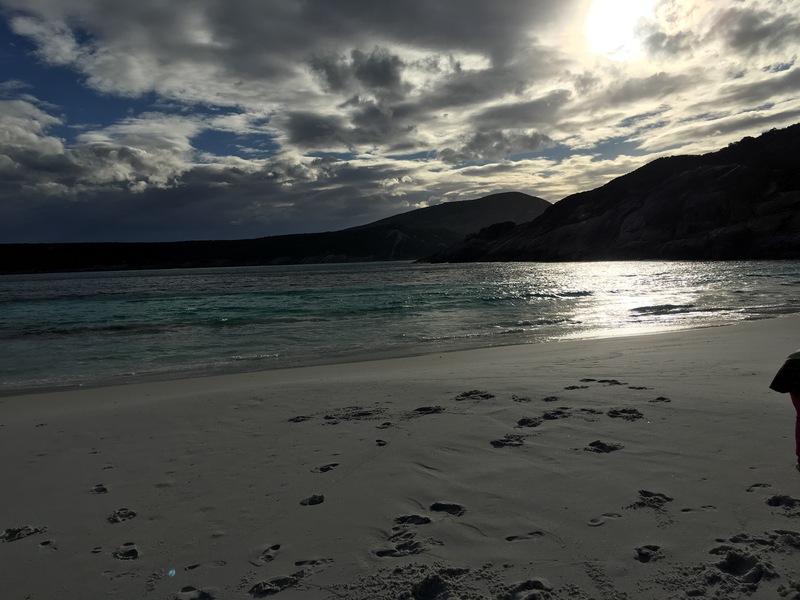 We left Parry Beach for Lucky Bay – after our time here I understand there are multiple reasons for that name but more about that soon. We pretty much just drove all the way to Cape Le Grand National Park, we didn’t even stop at Esperance as it was getting close to sunset and we wanted to set up before dark. I’d phoned ahead to make sure that we wouldn’t get out to the National Park to find the gates were shut from 5pm but was assured that at this time of year it’s unlikely to be full (you can’t book sites at this NP – I’m thinking ‘Hunger Games’ in the busy Summer months ‘may the odds be ever in your favour’…) and we could just find a spot and the Ranger or volunteers would catch us in the morning to pay our fees. We decided to set up the awning while we were staying here as it was a two night stop and the awning was still wet from our rainy days in Perth. A friendly neighbour came over to check if we needed a hand setting up as he could see that we were racing the sun setting but we managed to get it all up in time. (I love the people you meet when camping). Our campsite overlooked the bay and though there were a lot of trees between us and the beach itself, we could still see the water and it was lovely. I’m not sure if it was a mild night or if I’d just worked up a sweat setting up quickly before dark but I decided that we would sit outside and take in the view for dinner – it turned pretty cold pretty quickly and without a fire we soon went back inside after dinner. The last few days had been big driving days and very wet so I decided to turn the alarm off and try for a sleep in. 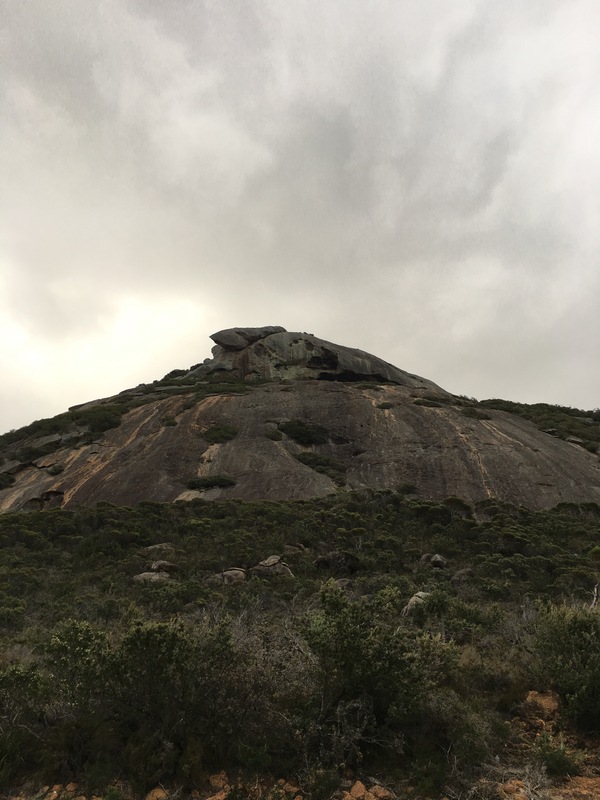 We were up around 9 and our friendly park volunteers came to collect our camping fees (National Parks are such a cheap and beautiful camping option) and gave us some great tips on things to see including the Matthew Flinders rock commemorating his landing here in 1802. 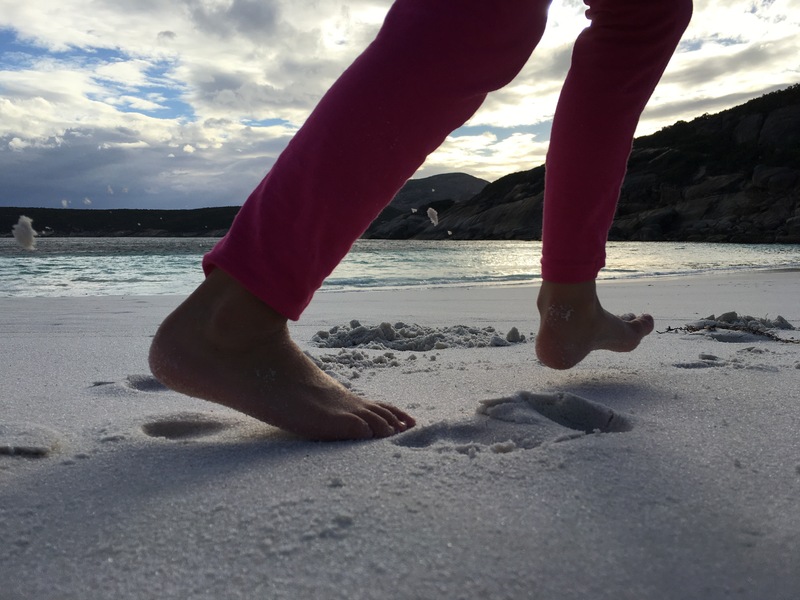 We thought we’d check this out first so we headed off down the picturesque sandy beach of Lucky Bay – the sand here is so white and squeaks beneath your feet as you walk. The water is crystal clear coloured a perfect turquise before blending to a smooth navy blue as you head further out into the bay. The water was inviting but we’re a cold blooded family (I think I may even be part reptile) so we didn’t go for a swim but walked along the shore enough to get our feet wet. I could see why this place was called Lucky Bay – I think we’re incredibly lucky to live in a country with such pristine beautiful beaches. It was very disappointing to see the amount of rubbush littered along the beach as we walked so when we saw a couple walking back from their morning fish I asked them if they had a spare plastic bag we could have. I put it in my pocket to use on the way back and we continued to the steps and lookout across the bay. We scrambled over the rocks and eventually made our way to the place where Matthew Flinders landed in 1802. 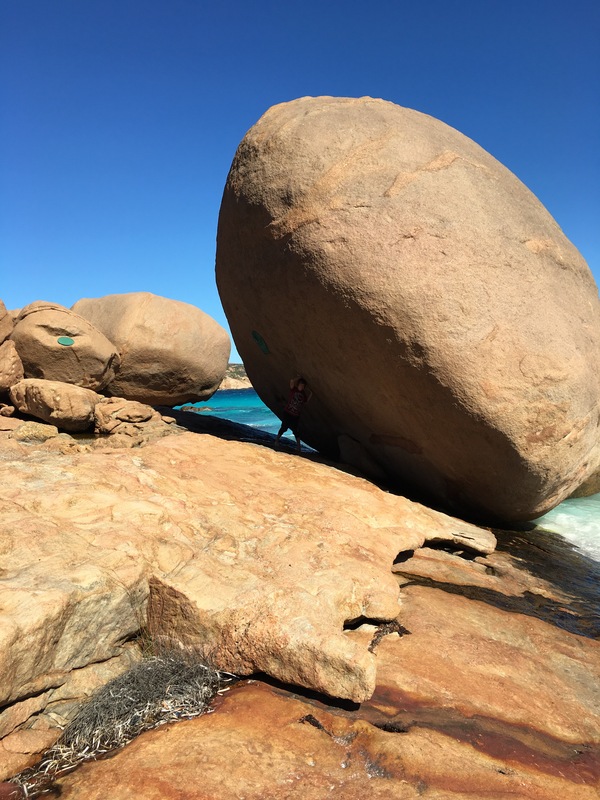 It was marked by a large rock seemingly held up by a far smaller rock at the bottom so the kids took great joy in pretending to hold the giant rock up above their heads. We managed some random phone service while at the rock so we phoned my nephew in Melbourne and sang to him for his birthday and told him where we were camping. We scrambled back over the rocks and headed up the beach back to our campsite, stopping along the way to pick up rubbish – mainly bits of plastic and nylon rope – we managed to completely fill the plastic shopping bag we had! Miss6 was very good at spotting bits of plastic in the sand and putting it into the bag and did most of the work until the wind started. We’d all had our pants rolled up and bare feet, enjoying the glorious sunshine and the feeling of the sand between our toes. Until the ‘sparkly’ sand (as Miss6 identified it) started whipping at our ankles in the wind and the feeling of sand soon spread to across our chest, in our eyebrows, in our hair and then finally in our teeth. I was lucky, I don’t go outdoors without sunglasses so my eyes had some protection, the kids however weren’t that lucky and took to pulling their clothes up over their faces and Miss6 even put her boots back on to avoid the sand hitting any bare skin as we walked. With the wind blowing directly at us (and stopping to pick up rubbish) it took nearly two hours to walk all the way back to camp for a late lunch. The wind started to pick up enough that the poles on the awning where beginning to move so we decided to take down the awning, just as our neighbours who’d been camping in a tent, decided to pack up and leave altogether. We got the awning most of the way in but in the wind and with the camper at full height (we normally set up and pack up the awning while the camper is wound down to avoid needing the ladder) we couldn’t get the zip done up and figured we’d just do that up in the morning when we packed up. After lunch we hopped in the car and drove out to Hellfire Bay and decided to make the 20 minute walk to Little Hellfire Bay, a secluded little area that was supposed to be sheltered from the wind – except for today. Like Lucky Bay, the sand was really white and squeaked under your feet and the water was crystal clear. The wind was a lot milder here than Lucky Bay but still blowing over us making that sunshine even more appreciated. The kids found a waterway that was desperately trying to make its way to the ocean and had fun blocking it off then letting it go in the hopes that the big surge of water would help it get there – and it almost did. We walked back along the path to the car, a very pretty walk amongst some trees, shrubs and wildflowers and even a few kangaroos on the way back (I quietly hoped that they stayed here and avoided the roadside for the drive home). We made a very quick stop at Frenchman Lookout on the way back, it was a very large hill/mountain that seemed to be all rock and had a strange little hole at the top which made it look like it was wearing a hat (a beret perhaps?) before parking back at camp ready for some hot showers. 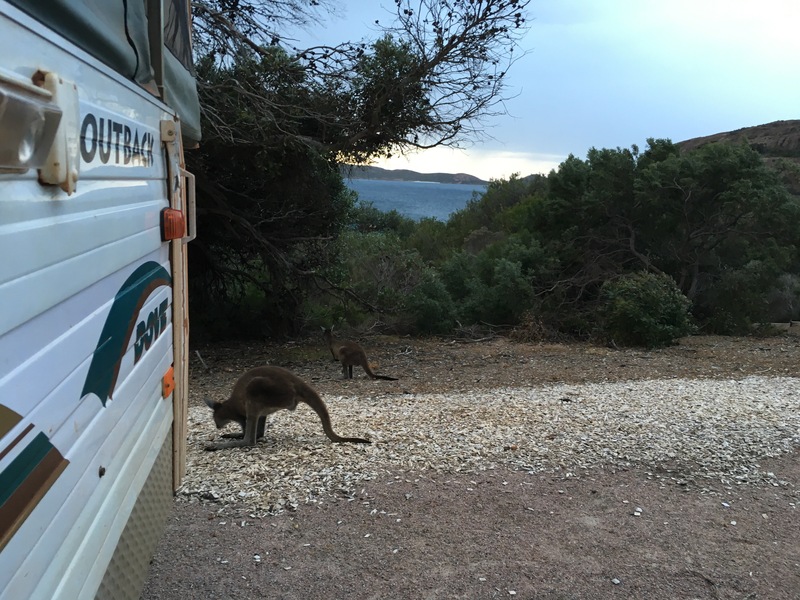 Miss6 and I went first (and she was delighted to see two kangaroos right at our doorstep when she opened the camper door to head to the showers!) and though the solar showers were nice and warm, like Parry Beach there wasn’t much pressure. We got back to the van to make a start on dinner while Master14 went to the showers, nearly getting blown over as he walked out the camper door. As I stood in the camper talking to Miss6 I couldn’t help but notice how much the roof of the camper was swaying left to right so I went outside to grab a couple of ropes to fasten to the roof of the camper and the ground to try to slow the rocking. The rain had started by now and I was getting drenched and blown away at the same time. When Master14 got back from his shower the wind had picked up even more and the rocking of the van continued so I asked him to come outside with me to wind up the legs a little so I could hitch the car to the camper – somehow the idea of having an additional two tonne attached to the camper in this wind was very reassuring. We both got drenched while we were out there and came back inside looking like drowned rats to find Miss6 crying as she was scared of the wind and thought that we were getting blown away outside. The winds reached 100km/h that night and it’s fair to say I got little to no sleep. Before this trip and even throughout it, people have asked me many times if I’ve ever felt scared camping alone and I’ve answered honestly no, never… until this night. The wind was so ferocious and the camper was rocking and moving about so much that I was very unsettled and repeatedly doing a risk management check in my head as the night wore on – ‘if this breaks, how would I fix it?’, ‘at what point do I move the kids and I into the main camper and out of the bed ends?’, ‘at what point do I knock on our neighbours caravan door and ask if the kids and I can sleep on the floor?’ – all of this went through my mind as the night wore on. Though we are in a camper, the bed ends are little more than a glorified tent simply sitting a few feet off the ground and held in place by some strips of velcro. I’m not sure if my ears were decieving me but at one stage I could’ve sworn there was hail. It was midnight and I was still awake – six hours solid of this wind – at this point I started to think ‘if the camper has survived unharmed for six hours already, it’s likely to survive another six’ and managed to fall asleep. I woke briefly to Master14 crawling in to bed with us, the pole on his bed had finally given way in the wind (it had been held together with nothing but two pieces of gaffa tape since the bracket broke in Silverton way back at the start of our trip – I’d bought a new bracket at the Jayco toy shop and figured I’d just wait til we got home to fix it). I went back to sleep with Master14 asleep between me and Miss6. I woke soon after to an almighty crack and shot up out of bed thinking ‘that pole is down – I should fix that bracket now before the bed end gets damaged in this wind’ so I got out of bed and whispered to Master14 to look after his sister while I was gone – it seemed like I’d lost Miss6 in the bed somewhere as I could only make out one body, but figured she was under the covers again hiding from the noise. I walked to the other end of the camper and turned on the kitchen light and got out the bracket – it was then I remembered that the screwdriver was outside in the toolbox and did I really want to brave the outdoors to fix this bracket? I’ll check the situation first, so I opened the curtains and went to turn on the light and realised that Master14 was sound asleep in his bed and the pole was still where it ought to be – I was so exhausted that I’d fallen into a deep sleep and dreamt the whole thing (not the wind – that was still VERY real). Back into bed with Miss6 who actually was under the covers hiding from the noise and I spent the rest of the night drifting in and out of sleep. The closer it got to morning, the more I contemplated not packing up, skipping Kalgoorlie and just bunkering down here until the weather died down. I didn’t know how we’d go trying to pack up in gale force winds – we’d had a couple of windy pack ups and they were a pain in the arse but the wind was nothing compared to this. 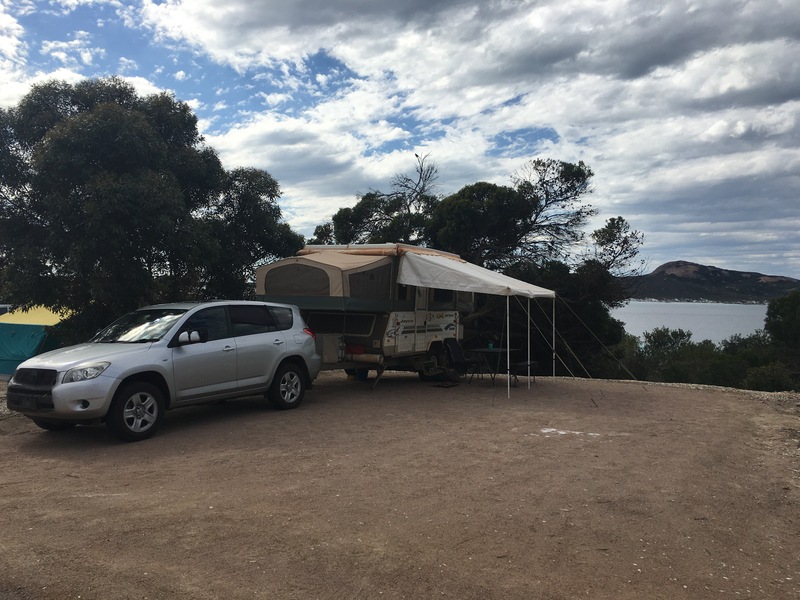 By the time it came to get up and start packing up, the rain had slowed to an ‘on again, off again’ and the wind had lessened enough that we thought we’d have a crack at packing up. We tried to stay indoors for as long as possible getting everything ready to go for the outdoors when we could hear the moments that the wind died down and the rain had stopped. We got almost to the end of the pack up and were trying to zip up the awning bag and clamp down the camper roof when the wind picked up and I’m sure it began to hail (if it wasn’t hail then it was the coldest, hardest, sharpest rain I’d ever felt and I’m from Melbourne!). Our hands were completely numb, red raw and quite useless by now so our lovely neighbour came over to help us out by grabbing the zip and zipping it up for us. I’d made Miss6 sit in the car to stay warm and dry but Master14 and I were soaked and freezing and I was exhausted before the day had even began (Master14 had slept like a teenager through the whole night so he was as fresh as a daisy). We had deliberately packed up without our jumpers (mine was still soaked through from the night before anyway) as we’d only brought one jumper on the trip and figured we would need them to warm back up again in the car. I cranked the heater, put on some dry trakkies and my ugg boots (so glad I packed them – though for those that know me, I wouldn’t go anywhere without them!) and we hit the road with high hopes of the wind and rain easing as we headed inland to Kalgoorlie. 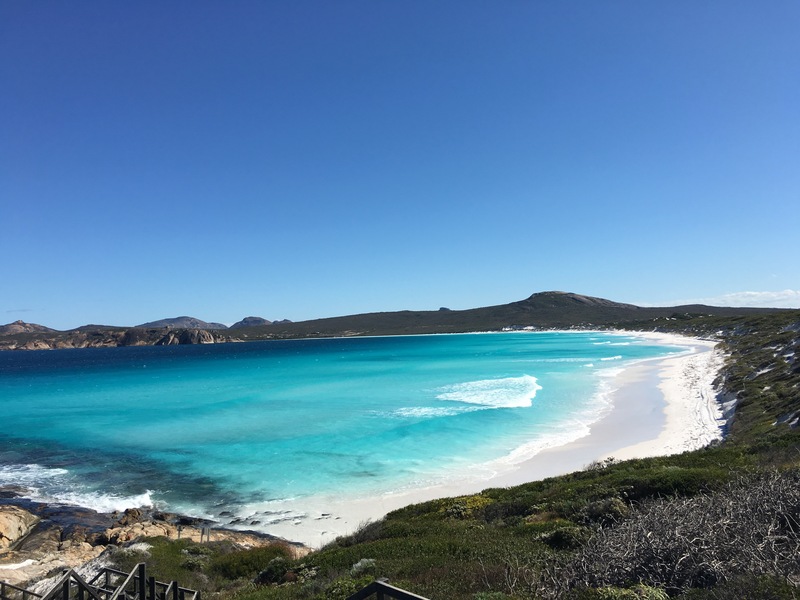 Lucky Bay sure is a beautiful part of the world and I certainly felt lucky to spend some time here and even luckier that we (especially the camper) survived a night of gale force winds here too.